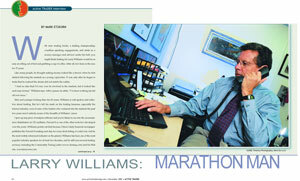 In the fall of 2006 we began the construction of LWU - Larry Williams University. This is the place to come to find courses, articles & books written by Larry. The intention is not to hit you over the head with advertisements for software or brokers or links to other sites. Our intention is to create a place where people who are interested in Larry's work and interested in the markets can come and study without banner ads streaming across the page. Long Term, Short Term, Swing, Day Trading? How do you develop the skills to become a good trader? How do you maintain those skills? Those are difficult questions to answer. Whether you have been trading for several years or just getting started, it's important to understand the markets and to keep your trading sharp. We don't suggest that the only road to success is the one Larry recommends below. However, many of his students have been successful following a logical sequence in futures trading education. I stumbled around like a drunk in the dark during the first three years of my trading. I had read all the books out there, tried all the techniques... but was getting no place. It was not until I met Bill Meehan, that it all came together for me. Bill explained to me that the big money was made by having small positions in big moves. Bill, a former member of the Chicago Board Of Trade, taught me the importance of fundamentals, and how to determine when the market was ready for a substantial up or down move. Once you know that, it is just a question of timing as to when to get in, out, and how to protect yourself against losing trades. I still think this is the safest and most reliable way of making money in the market; the most certain. It is what most people should be doing. By the way, it took me about 10 years to get good at this. Once I started to become proficient at the longer-term set up trades, I was able to focus on swing trade. My average length in a trade went from a few weeks (or months) to a few days. This form of trading is for people that are active, but probably still have jobs or careers. It was the second phase of my education as a trader. Day trading is the dream of most would-be traders. They see themselves wearing their pajamas, sitting in front of their computer screens making money. I will be the first to tell you those dreams will turn into nightmares. There is nothing more difficult than day trading. It is the most physically and mentally challenging thing you can possibly do in the marketplace.Yet, this is where most traders begin! Fools rush in where only wise men fear to trade. I can show you how to become day trader... I finally learned to do it in 1987 after trading for some 25 years. I can save you a lot of time and a lot of aggravation. Frankly, however, I don't want to teach it to you until you have the basics under your belt. To be a good day trader, you have to understand the all important aspects of money management, risk control market, fluctuations, your own personality, how you handle the fear, and how quickly you can react to a situation... There are just so many things that need to be ingrained in you before you start day trading. There are no black box success systems to day trading. So now you know how I got to be where I am... it was a distinct path from confusion to creating a career. Order came into my life once I understood the longer-term fundamental workings of the markets, then understood the technical structure of the marketplace... And, finally understanding what causes short-term swings. As I see it there is a logical sequence that all traders who are successful make. That's why the Larry Williams University starts with the basics and moves forward. It's no different than building a house. You need a foundation and the foundation of successful trading comes from understanding the marketplace. It does not come from day trading. Day trading is the last thing on our list, not the first thing. If you try to do it the other way around... you will be back to the Larry Williams University to learn the truth of trading. Enrollment for all futures classes is closed until the Spring Sessions begin in 2019. Stock Trading and Investing is currently open.